Published: Dec. 23, 2012 at 08:56 p.m. Updated: Dec. 24, 2012 at 07:44 p.m.
Tennessee Titans owner Bud Adams isn't ready to start making changes on his coaching staff just yet. But he wants answers from coach Mike Munchak, and he wants them soon. 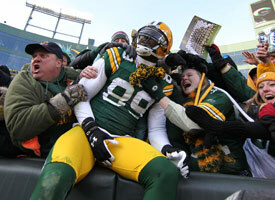 Check out the best photos from the Week 16 matchup between the Titans and Packers. "We can't keep losing games like we lost today, and I mean it," Adams told TitanInsider on Sunday, hours after his team's 55-7 loss to the Green Bay Packers. "We've played some good games and looked pretty good at times. But we just need to sit down and go over everything, which I'm not making any decision now. I have to sit down with them and get their views and their points on things and go from there." Adams, 89 years old, watched the Titans' 10th loss of the season from his Houston home. He couldn't even watch the whole game. "I was pretty upset," Adams told The Tennessean. "I just didn't want to watch any more of that mess." Adams was asked if he's mad enough to fire Munchak, who's 14-17 in two seasons as the Titans' coach and has a contract through 2014. "I like Mike, I really do. But liking him and getting the job done are two different things," Adams said. "If he is not getting the job done, that is what I have to find out. Right now, we are not looking very good. Something is wrong, and I want to find out what the problem is and what needs to be done to fix it." Oh boy. Munchak's seat is going from warm to scalding. It doesn't sound like Adams will be ready to make an immediate move on "Black Monday," but it sure sounds like he's at least considering a change.